Legendary Spanish filmmaker, Pedro Almodóvar’s latest film is a radical departure from 2013's I’m So Excited – but all the stronger for it, says Alex Hopkins. In his long and distinguished career, Spanish auteur Pedro Almodóvar has boldly championed the outsiders of society: the prostitutes, drug addicts and drag queens, inhabitants of a sometimes seedy, always highly-charged nocturnal world which defy respectability. But his strongest films are arguably those that explore the female psyche – stories of lives which have been marked by loss but are then reclaimed through the triumph of humanity over a hidden past and torturous present. His new film, Julieta, sees him returning to this familiar territory, and as such it is perhaps his finest outing since 2009’s Broken Embraces. The narrative is based on three short stories from Nobel prize-winning Canadian author Alice Munro's Runaway. Julieta is about to leave Madrid with her lover Lorenzo (Darío Grandinetti) when a chance encounter throws her ordered world into disarray. There’s something that the middle-aged Julieta – played here with a fractured elegance by Emma Suarez – has never told Lorenzo: that she has a daughter, Antia, who mysteriously disappeared as a teenager. When she meets a former friend of Antia’s, Julieta begins to unravel, locking herself away and writing a letter to her daughter which recounts the story of their relationship. What follows is an exquisite study of grief and memory. In typical Almodóvar fashion, the narrative takes on Hitchcockian proportions by switching back and forth in time and space. We meet the young, beautiful Julieta (Adriana Ugarte), who had another, earlier chance encounter, this time on a train with a dark, brooding fisherman called Xoan (Daniel Grao). They conceive Antia and embark upon a dangerous relationship, played out against a bleak seaside backdrop (reminiscent of Daphne du Maurier's Rebecca, complete with Almodóvar muse Rossy de Palma giving a darkly comic turn as a severe housekeeper). Tragedy strikes, leaving Julieta mired in depression – a state only exacerbated by Antia’s sudden departure. Those expecting the zaniness of I’m So Excited may be disappointed. This is possibly the Spaniard’s most serious film to date. It is devoid of humour, and the subject matter is unapologetically dark - though it is beautifully shot with the usual Almodovarian emphasis on color: red dominates here, which perfectly complements the intensity of Julieta’s barely contained emotions. This movie is about guilt, secrets and the silences that can rip a family apart. Almodóvar’s genius is to examine how much of this one woman can bear before she can break free from shame and salvage something from what is ultimately the only relationship that matters: the bond between mother and daughter. 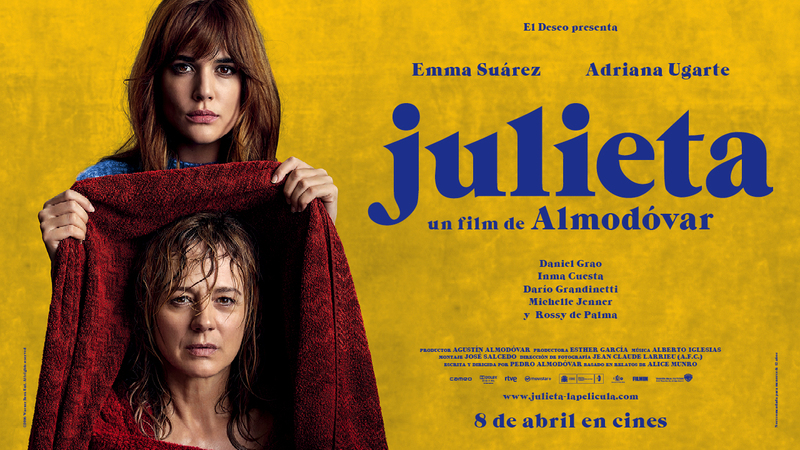 Julieta was released in the UK on 26th August 2016 and will debut at the New York Film Festival before being released to the American public on 21st December 2016.